Sydney's Sauce Brewing is one of the breweries that's turned the city's inner west into a craft beer haven, specialising in hop forward beers. If you'd like to help get their beers into the hands of more people around its home state, the brewery is looking for a new sales manager. Sauce Brewing Co is one of Australia’s most exciting craft breweries. Our brewery is in the heart of Australia’s craft-beer capital – Marrickville in Sydney’s inner-west. We are a small team of passionate people, producing some of the best beers (we think) this side of Pluto. We have a solid core range and a regular special batch program. Sauce is now well established and enjoys a strong brand presence nationwide. 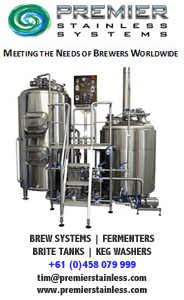 We are seeking an energetic and experienced on-premise sales professional to really ramp up our keg sales in NSW. As part of a dynamic, entrepreneurial culture, the successful candidate will be highly self-motivated and driven. This is your opportunity to join one of the up and coming leaders of the independent brewing industry. Attractive remuneration package consisting of a competitive base plus bonuses and car allowance. Applicants must have the right to work permanently in Australia. Previous experience selling beer or alcohol in a B2B on-premise role is a must. We are a dynamic team. We all pitch in to get the job done, but we also know how to have a good time – we’re in the business of beer after all! To apply, please email your resume to employ@sauce.beer, and tell us a bit about yourself – tell us why you'd be perfect for the role. Applications close on March 31, 2019.